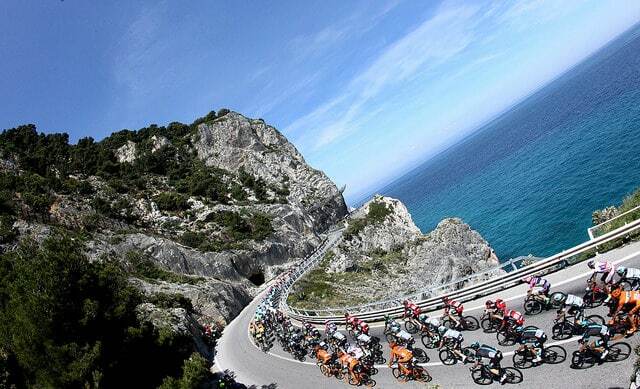 The Giro d’Italia has been great to watch – beautiful Italian scenery, exciting, unpredictable racing – and as stage races go a lot of drama and excitement. If the Tour de France could replicate that intensity, we could be in for a treat. Hopefully, if the main contenders stay safe in the crazy first week, there will be many more people to seriously challenge for the lead. Contador / Nibali / Froome / Quintana – sounds an absorbing competition. One of the abiding images of the Giro was watching Alberto Contador dance up the Mortirolo climb picking off the straggling peleton like he was a pro coming across a Sunday afternoon club run. It was a really great stage. Similarly, it was just as good to see Contador suffer on the last stage. – Expect the unexpected with this Giro. I’m a great fan of the Corinthian endeavour – amateur ideals of sport and all that. But, the thing with professional cycling is that it is often the badly timed crash / puncture that really lights up the race. If the main protagonists stopped racing every-time someone came a cropper, it would become more like a charity ride, than a race. I guess you have to take the rough with the smooth. The sportsmanship in pro-cycling that really matters is riding 100% clean. Still, the ever-unpopular UCI rule makers should revisit those rules about fining riders who swap equipment from different teams. I think it’s good if rival team mates want to offer a spare wheel out of friendship or sportsmanship. It’s always good to have rules that outsiders to the sport understand. Unless you have spent many late nights reading the UCI rulebook you will probably struggle to understand the two minute penalty give Porte and Simon Clarke (BBC link) for nothing more than a wheel swap. The one shadow over the Giro is why they have to always commemorate Marco Pantani as the great hero of cycling. To me, he never will be. The abiding memory of Pantani is (apart from his ridiculous Heamocrit levels) was leading the peleton protests (photo) against ‘proper drug enforcement at the 1998 Tour de France (the Tour of the Festina scandal)’. Pantani was a tragic life, a cautionary tale, a man who perhaps deserves sympathy, but, I struggle to feign admiration for any drug users – be they Pantani, Armstrong or Ullrich. Finishing on a more positive note – another highlight of the Giro was seeing a new generation come through, like David Formolo’s successful win from a break. That was really good. Hope to see him keep progressing for next few years. I felt like it was the first grand tour with a massive amount of riders that “changed their diets” (Amador, Porte) or were even ill (Aru) and all lost suddenly some kilograms. After the circ report named cortisone and new drugs like GW1516 I felt ridiculed. Especially Astana has overdone it. Great blog, really enjoy reading it. Re the sportsmanship and the UCI rule to prevent inter team assistance it was put in place to prevent richer teams from buying assistance. Imagine a situation where by a rider on a smaller team might be offered more money than he earns on his minimum UCI wage to hand over a wheel foregoing a slim chance at a win for a guaranteed pay day. At the moment the rules prevent him from doing so as in a single day race it is a DQ for both. Before anyone says Vinokourov Liege Bastogne Liege or the Olympics we are talking something slightly easily proven!! The other side of the coin is whether Simon Clarke would have handed over his wheel to Contador or Uran in the same situation? If he hadn’t would he be seen to be a bad sport or would no one bat an eyelid as they aren’t mates? With Pantani I have a much greater sympathy than I do than the others listed. Having read Matt Rendell’s ‘The death of Marco Pantani’ it strikes me that Pantani was a victim of the professional cycling scene at the time. EPO abuse was rife when he entered the pro ranks and it still was when he lost his life. He was no better and no worse than his contemporaries unfortunately he ended up dead whilst Armstrong was still winning the Tour de France. I believe that had the sport been ‘clean’ he would have still been the best climber of his generation. I don’t think Armstrong, Ulrich, Riis et al would have been in the same league in the high mountains. Its easy to say he had the choice to not take EPO but, in honesty, I was desperate as kid to be a pro cyclist in the 90s and had I had the opportunity would I have walked away from my dreams? I don’t think I can honestly answer. Anyway I don’t want to come across as an apologist for dopers thats not the case. Something about Pantani’s story strikes a chord with me that the other dopers do not.